Nowadays the role of community participation in the policy making process has been highlighted as a guarantee of success and quality of public policies. It is argued as a way to ensure transformation of existing development practice, of the social relations and institutional practices that cause social exclusion (Hickey and Mohan, 2004, p.13). UN-Habitat seems to capture the mentioned concepts by establishing participation and the equitable distribution of charges (costs) and benefits as important and key urban and territorial planning principles (UN-Habitat, 2014). This phenomenon has been extended up to all the possible fields of policy making. Thus, land management policies cannot be the exception for this. Therefore, the literature and organisations like UN-Habitat have started to highlight the benefits of the application of community participation in land instruments which are highly connected to people like Land Readjustment (LR). In this sense community participation is seen as a tool to improve the performance and outcomes of Land Readjustment as a land management instrument (Hong and Tierney, 2013). This work explores the impact or influence that community participation can have in Land readjustment projects. In specific it analyses this relationship in one of the most important characteristics of this land instrument: the equitable distribution of costs and benefits. This study argues that community participation can have an important impact in the equity of the distribution of costs and benefits of the LR, by enhancing it or undermining it depending on the variables with which participation takes place. The outcome of a participation process is influenced by several variables because these processes are not static. The outcomes can change and influence the proposal discussed between the promoters of the instruments and the landowners, having an impact on its equitable distribution of costs and benefits. By focusing on the LR of the triangle of Fenicia in Bogotá Colombia as a specific case study, this research examines the most important variables of community participation in the case of Fenicia that influence its outcome. This illustrates how participation affects the equitable distribution of costs and benefits of the readjustment from the perspective of theory in this field and in two specific cases which are bound by Colombian law. The study makes use of qualitative information, obtained through interviews and meeting with key informants and the review of secondary and primary documents. The analysis of the information led to the identification of how the main variables affect the outcome of the participation process, Moreover, the impact on the equity of the distribution was assessed through a qualitative analysis based on rules extracted from theory that point out in which situations or with which characteristics a readjustment can be equitable or not. The community participation process of the triangle of Fenicia results showed2 stages. Each of the stages revealed a different impact on the equitable distribution of costs and benefits. The most important one took place during the second stage. The variables type of participation, social capital, power and participatory invited space, influenced the final outcome of the process through the forms of agreements between various parts of the community and the promoter. This provoked changes on the readjustment proposal. In the case of social capital, the social relationships among the actors and their networks played an important role in the process provoking new spaces for participation and providing professional support to the community. Power played an important role through elites of the area and their features which gave them the capacity to capture the process and its benefits. In this case those benefits were spread among the community. The type of participation “partnership” was a project changer through trade-offs and agreements. Consultation and information also took place, which suggests that not any kind of participation impacts the equitable distribution of costs and benefits. 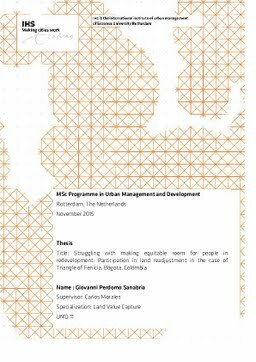 Finally, Participatory invited space through specific design characteristics like participants, event format and decision criteria facilitated a type of participation that change the project´s equitable distribution of costs and benefits. The changes to the project by participation had impact on the equity in the distribution making it more inequitable. Costs were not paid in proportion to the benefits received allocating several windfalls on the community producing what theory calls benevolent elite capture.